Who is Radha? 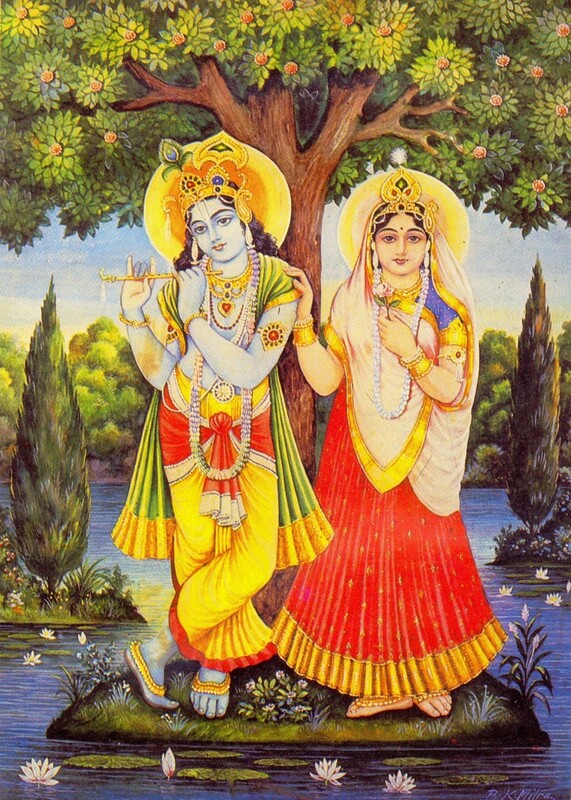 When you see a picture of Radha Krishna, people wonder, “Who is the girl next to Krishna?” This is Radha. When we speak of Krishna, we are speaking of the Supreme Lord, the Supreme Personality of Godhead, the Cause of all Causes. In other words, when we speak of Krishna, we are speaking of God. Usually when people think of God, they think an old man because God is known as the one who is the most ancient. He is the original person. For example, Michelangelo painted God on the ceiling of the Vatican, as an old man with a white beard, thinking that if you’re old then you have a white beard. This is due to the materialistic idea that people have that God has a material body like us so if He’s old, He must have a white beard. But in the Vedas we find information about God that makes it very clear that although God is the oldest, His form is not old. He is ever fresh. His form is completely spiritual. Although not seeable by these eyes, in fact, God is a person with a spiritual form. Many people like to think of God as void of personality and therefore void of form, void of any gender in that sense. But in fact, Krishna is male. God is male. The evidence in the Vedas is that the Supreme Person exists in His kingdom but He does not exist alone there. The idea that in the kingdom of God, God is sitting there very lonely on the throne – growing old alone – is again a mistake due to the insufficient information that people have received. In fact, God is not only the most attractive and ever fresh youthful person, but God does not exist alone. There is one person who is the closest to Krishna, the Supreme Person, whose love for the Supreme Lord is greater than the love of anyone else for the Supreme Lord and that person is Radha. Radha is, in a sense, not separate from Krishna. In the Chaitanya Caritamrta we find the statement that “Srimati Radharani is the embodiment of mahabhava and the crest jewel among all the lovely consorts of Lord Krishna.” The ultimate development of love for God is Radharani. So who is Radha? Radharani is the ultimate repository of all good qualities. When we speak of Radharani, we are speaking about the original feminine quality. In this material world we find male and female and in the Old Testament there is a description that God created humankind in His own image. Male and female. So this means ultimately that God in this sense is male and female. Female, there is Radharani. Male, there is Krishna. The female is coming from Krishna, the Original Cause, and what is she? She is that potency of the Supreme Lord which is love for the Supreme Lord. The technical word is hladini, the potency of love of God. When we speak of Radha, we are speaking of the energy of Krishna which is loving Krishna, the energy of God which is loving God. We are all parts and parcels of God and we have the potency to love God and this is due to Radharani. Radharani is the ultimate surrendered entity to God and we are all ultimately dominated parts and parcels of God who should be surrendering to God. So our business is rendering service or surrendering to Radha Krishna. Radharani is the original mother. There are so many universes and in every universe there is a mother of the universe. Radharani is the original mother. So as Krishna is our father, and Krishna is also our mother, Krishna is our friend, Krishna is our master, Radharani is that aspect of Krishna that is our mother. Krishna is our mother in Radharani. We cannot separate Radha from Krishna so when we say Krishna is our mother, we say Radharani is our mother, there is no difference. When we pray to Radharani we must be praying that I am spirit soul and she is my mother. 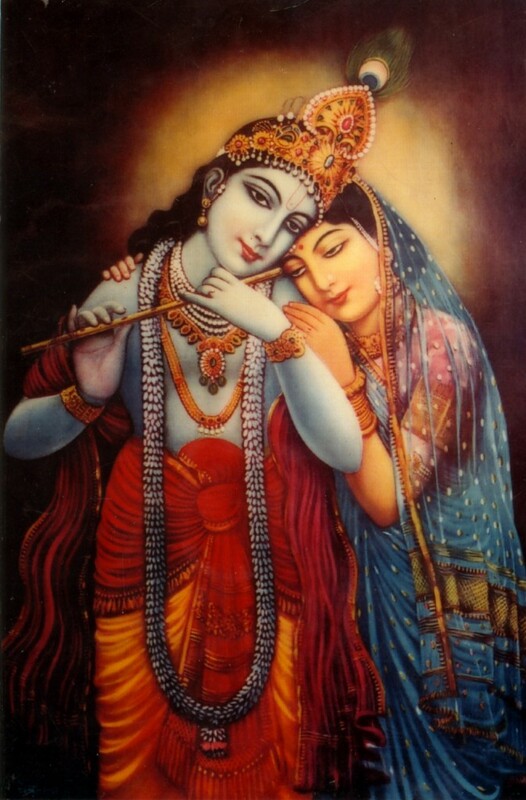 Radharani is the perfect original lover of Krishna, not separate from Krishna. It is described that just as Lord Krishna is the cause of all incarnations, so Sri Radha is the cause of all the consorts namely the goddesses of fortune, the queens and milkmaids of Vraja. They all proceed from Radha. Another way to describe the Goddess of Fortune is Lady Luck. The gamblers hope Lady Luck is with them. The Goddess of Fortune – Lady Luck. The Goddess of Fortune is a partial manifestation of Srimati Radhika. And the queens, those who are loving Krishna in the spiritual world as queens, they are described as reflections of Radharani’s image. “The goddesses of fortune are her plenary portions and they display the forms of vaibhava vilasa.” It explains that, “There are many manifestations of Srimati Radharani to assist in the Lord’s pastimes.” In the spiritual world you find many types of helpers in the pastimes of Krishna in the form of goddesses of fortune, in the form of queens, in the form of consorts. These are all ultimately coming from Radharani. So in Radha you find the original perfect beloved. When we speak of Radha we are speaking of Krishna’s original perfect beloved. The perfect beloved of the Supreme Personality of Godhead. When we speak of Krishna we are speaking of the Supreme Enjoyer. The Supreme Enjoyer is enjoying Radha. What is He enjoying? He’s enjoying this loving relationship that He’s having with Radha. It is love. Why is He attracted to Radha? He is attracted to Radha because of her perfection in her love for Krishna. The love that Radharani is having for Krishna cannot be separated from the love she has for all the children of Krishna. As the mother she loves all of the children of Krishna. So when we approach Radharani we have to understand that more than anything else, she wants me to be happy loving Krishna. She wants to introduce me to Krishna and make it so that I can be actually having Krishna so that I can be happy. August 30, 2017Who Is Krishna?